Roses need special care to reach their full potential. Follow these guidelines to get the most our of your summer blooms. Like most stars, roses are divas. When left to their own devices, they get tangled and produce only when they feel like it. They need special care to live up to their star potential. Follow a few guidelines and you’ll secure bountiful blooms, no matter the variety. 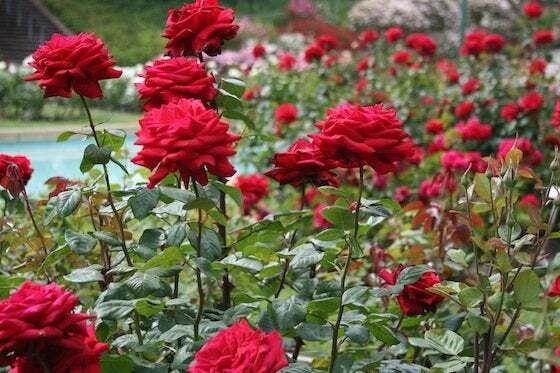 Watering: Most areas of the country need to provide additional water for their roses. Water the soil around the rose providing about one or two inches of water every week—more in dry times. Rose root systems go quite deep, so make sure to water long enough to get 15 or so inches down. The best time to water is in the early morning, so that any residual moisture left on the leaves burns off, preventing fungal infections. Fertilize: After each flush of blooms, feed your flowers. Any general-purpose fertilizer will do. Stop only in August to keep from encouraging new growth that will struggle come fall. In addition, mulch will deter excessive weed growth and moisture loss and will enrich the soil as it breaks down. Lay down two to four inches and continue replenishing as the season continues. Deadhead: Trick your re-blooming roses into continual flowering by removing spent blossoms, so that the plant keeps trying to reproduce (rather than ending the season with rose hips, the fruit of roses). This means cutting back the bloom stem down to the first or second five-leaf set—do so by keeping a 45-degree angle and sloping away from the outside of the cane. Pruning: After blooming has finished, you can do some pruning to ensure next year’s harvest. Take out all the dead branches and cut away any damaged canes first, before shaping the shrub to open up the center for better circulation. Cut back any old canes until they show healthy green tissue. Invest in a sharp pair of good quality pruners. Don’t forget to remove suckers or that new root growth sometimes crowds out the established canes. Don’t miss Roses: 11 Sensational Varieties to Consider for a slideshow of rose varieties certain to add color, beauty, and fragrance to your yard and garden this summer.